Scientific Committee: Franco Moretti, Marialina Marcucci, Giorgio Del Ghingaro, Arti Ahluwalia, Marcello Lippi, Diego Sánchez Haase, Gergely Kesselyak, Pericle Salvini, Monica Murero, Franco Mosca. Dr. Streben is fundamentally inspired by the myth of Pygmalion, with particular reference to Ovid’s Metamorphoses, to the De rerum natura of Paracelsus, as well as to the Faust by Johann Wolfgang von Goethe. The libretto is inspired by the poetry Dualismo by Arrigo Boito. In Ovid’s Pygmalion, a sculptor modeled a naked and ivory female statue, of which he had fallen in love considering her his feminine ideal (Galatea). On the occasion of the tribute in honor of Aphrodite, who went to the temple of the goddess, he begged her to give him the sculpture in marriage, to transform it in a human creature: the goddess consented. He saw himself the statue slowly animate, breathe and open her eyes. Dr. Richard Streben is a direct evolution of Pygmalion. Unlike his predecessors, Dr. Richard Streben does not believe in Gods or magic formulas. He believes, however, in the alchemy of robotics. 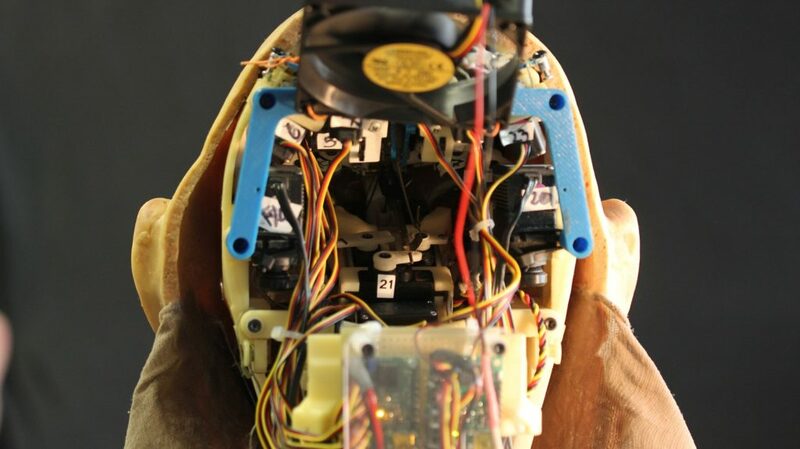 If robotics is grafted onto the human body, it can “have” a soul. The work also aims to be a sort of Turing Test, which evolves between robot, audience and Dr. Streben. This is done by involving audience in first person through technology. At the entrance of the show, people (audience) can connect their mobile phone to the “robot” through an app. Thanks to this it will be possible to “see” the opera from the point of view of its eyes too. In the end, when there will be the transformation of Dr. Streben from human to cyborg, that is when he engages parts of robot on his body, the audience will see on cellphones what he will see, the Streben cyborg, or rather‬ Umy the robot and no more the mental projection of Galatea.